This conclusion of the anthropologists who have examined the human remains form Kamenovo in Bulgaria’s Razgrad District, has been announced by the Ruse Regional Museum of History in a wrap-up of the 2015 excavations in the town which also led to the discovery of a Chalcolithic workshop for flint tools in the first phase of the digs in May-June. The archaeological excavations of the Chalcolithic settlement mound and what has turned out to be a large-scale prehistoric tool production center have been organized and funded by the Regional Museum of History in the city of Razgrad and Bulgaria’s Culture Ministry. They have been led by Assoc. Prof. Yavor Boyadzhiev from the National Institute and Museum of Archaeology of the Bulgarian Academy of Sciences and Dimitar Chernakov from the Ruse Regional Museum of History, and Dilen Dilov from the Razgrad Regional Museum of History as the deputy head of the expedition. In its media release, the Ruse Regional Museum of History reminds that the discovery of the Chalcolithic workshop has yielded a lot of flint materials, including nuclei for making flints tools, semi-processed tools, and fully completed tools. It points out that the archaeologists have found a clay-coated ground where the production of flint tools took place. Much of the flint material was first heated in order to fashion billets for different types of tools out of it. The flint was extracted from quarries near today’s towns of Ravno and Topchii which are located not far from Kamenovo. The archaeologists have found that the production center making the flint tools started operation as part of the excavated settlement in the Early Chalcolithic, i.e. around 4,800 BC. In the Late Chalcolithic, around 4,500-4,200 BC, “as a result of demographic and economic changes", the flint workshop grew outside of the settlement, and covered a large area where part of the town of Kamenovo is located today. The flint tools produced in Kamenovo’s Chalcolithic predecessor in today’s Northeast Bulgaria were exported all over the southern parts of the Balkan Peninsula. “Much of the flint material found in almost all of the prehistoric sites excavated in Bulgaria originated in Kamenovo," states the Ruse Museum. With respect to the other major discovery from the Chalcolithic settlement, the necropolis, the Museum explains that a lot of graves with funeral inventories from the Late Chalcolithic are known to have been destroyed during the construction of the school yard in Kamenovo in 1910. 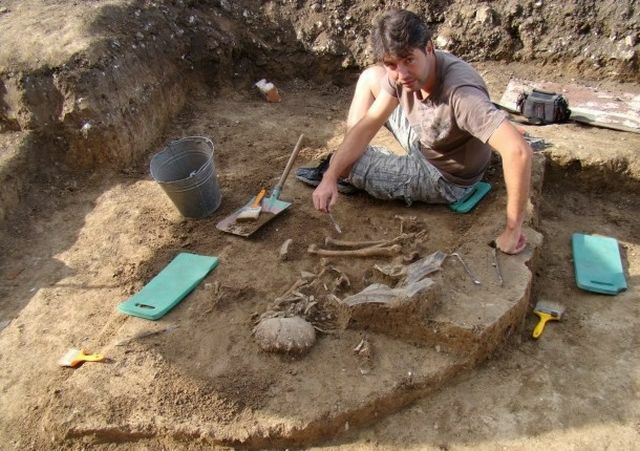 In September 2015, the Bulgarian archaeologists excavated a total of eight graves, which are part of the large necropolis dating to the Late Chalcolithic (4,500-4,200 BC). All of the skeletons have been found to have belonged to women aged between 14 and 50, and to children; all of the people buried in the necropolis are from the so called Mediterranean anthropological type. Their bodies were placed in the graves in fetal positions, on their left sides, pointing in the eastern and northeastern direction. At the time of their funerals, the bodies were covered with small embers and lumps of red ochre. In all of the excavated graves, the archaeologists have discovered funeral inventories consisting of artifacts such as ceramic vessels, flint tools, and beads from different types of rock. In one of the child graves the researchers have found three beads made from the shell of the Spondylus mollusk put on top of the skeleton. The Spondylus mollusks were harvested in the Mediterranean in prehistoric times, and this find is seen as evidence of the trade relations of the Chalcolithic people in today’s Northeast Bulgaria with the populations to the south. According to the release of the Ruse Regional Museum of History, one of the most interesting discoveries from the Chalcolithic necropolis in Bulgaria’s Kamenovo is a double grave containing the skeletons of a woman aged 40-50, and a 1-year-old child. The grave itself had been covered with a perishable material, possibly wood; two large clay vessels had been placed on top of that cover with their bottoms up. On top of another of the graves in Kamenovo, the Bulgarian archaeologists have unearthed fragments from three ceramic vessels which are found to have been placed on the grave, and smashed on the spot after the funeral as part of a ritual. The archaeological excavations of the 6,800-6,500-year-old Chalcolithic settlement in Bulgaria’s Kamenovo with its necropolis and workshop for flint tools are expected to continue in 2016.